Allergies are one of the most common issues affecting our pets today. Causes range from fleas to food to environmental to direct contact. Overall symptoms can include itchiness, red skin, hair loss, scabbing, ear infections, red bumps and even vomiting and diarrhea. Secondarily, these can lead to lethargy, inappetence, changes in thirst and general sickness. If you are concerned your pet is exhibiting any of these symptoms, schedule an appointment to have them examined. Diagnosing and treating allergies can be a fairly involved and lengthy process, but it can be very successful and vastly improve the quality of your pet’s life. We can develop an appropriate diagnostic plan to work towards the root cause and treat your pet accordingly. Our veterinarians are well versed in this process and can help your pet achieve this improved quality of life. This is the number one cause of allergies in our pets. These little parasites bite your pet and feed off their blood. In susceptible animals, this bite can cause a severe allergic reaction. Luckily, this is also the most preventable form of allergies. All pets should be protected against fleas YEAR ROUND! Despite the fact that people feel there is a ‘flea season’ in California, these parasites do not disappear for the winter. Protection is best found in monthly products that are either administered topically or orally. This is something your veterinarian can discuss at your visit, choosing the product that best suits your pet and their risk factors. If a problem has arisen, we can also help guide you how to deal with a flea infestation. Remember what you see on your pet is just the tip of the iceberg! Just like people, dogs and cats can develop allergies to food. These usually manifest as diarrhea, vomiting or itchy skin. The most common cause of food allergies is the meat protein source, however other ingredients may also be the culprit. (Symptoms may include the above outline allergy symptoms of those exclusive to the digestive tract, such as vomiting or diarrhea and weight loss.) These will often be year round symptoms, but are not exclusive to food allergies. It is important to note that even if your pet has not changed food, they still can develop an allergy to a food they have been on for a long time. Our veterinarians can speak with you about dietary and elimination trials to work towards the potential causes and develop a long term management strategy to provide improved quality of life for your pet. Atopy is a term used for animals that suffer from environmental allergies. These pets may exhibit more significant symptoms at certain times of the year, but it may be year round. Symptoms may also be mild to severe. Environmental allergies can include grasses, pollens, trees, dust mites and storage mites. Diagnosis can be difficult and is often done after parasitic causes and food allergy causes have been ruled out. There are blood tests that can be sent off to special laboratories that evaluate the root cause of the allergy. Potentially these can lead to a series of shots to build tolerance to these particular allergens. Often we cannot cure atopy, but it can be managed through medications and lifestyle changes. 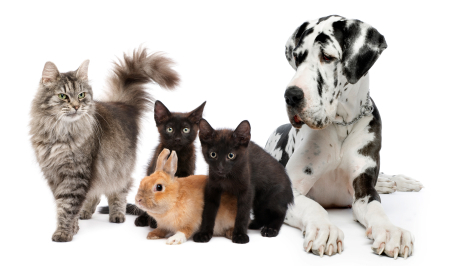 Our veterinarians are trained to guide you through diagnosis and management of all your pets’ allergies. A less common version of allergies, we can see pets appear with a rash after contact with something they are allergic to. This can include a new dog bed or sheet with a material they are allergic too. For example: some dogs are allergic to the cedar commonly used as a filler in dog beds. In addition pets can be allergic to certain laundry detergents, dryer sheets or fabric softeners. Inquire with one of our veterinarians if you suspect this may be the case, to develop a plan for relief and prevention. As discussed with flea allergies, there are a number of products we carry that can help prevent flea infestations and allergies. Historically there have been many good products, however overtime these anti-parasitic medications have developed some resistance and may not provide the necessary protection. As such we offer newer products such as Vectra, Trifexis and Revolution. While a majority of dermatitis cases are caused by allergies there are also a number of other potential causes. These causes can range from metabolic and immune mediated diseases to mites and even poor nutrition. These conditions can range from mild to life threatening. Just as with allergic dermatitis, our veterinarians can help guide you through a diagnostic process to establish and treat your pet’s condition.